The Ad Set creation flow has introduced improvements designed to optimize the advertiser workflows. We now support reach campaigns to get more people seeing your ads and a new ad placement called “Instagram Video”. 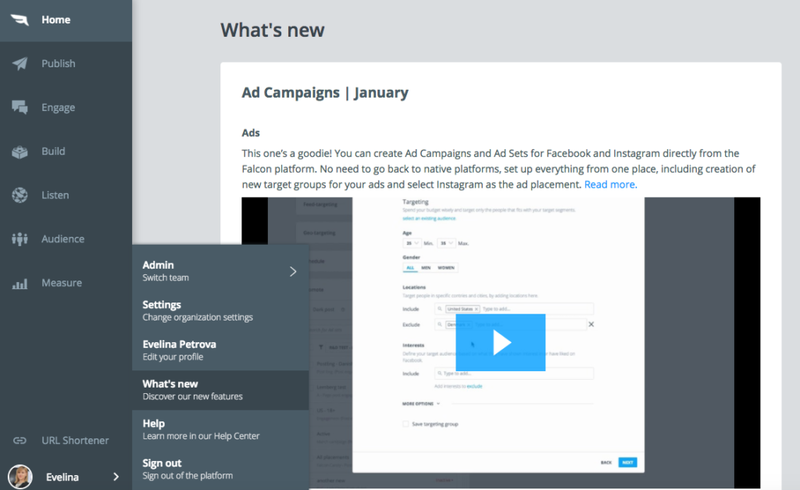 A “Create and Promote” button has also been added to make the flow clearer and increase your ads’ retention. The Ad Set selector in Publish’s Promotion Widget now features a “View more” button. This shows an Ad Set in greater detail to help you make your choice. You can now also promote geo-gated and feed targeting organic Facebook posts in the Publish editor. Once your Ad Set has been created and promoted, you can start monitoring the performance of your Post. The new “URL Parameters” in the Ad Options allow the customization of URL-tracking parameters. For people promoting their organic content with links, the URL Parameters feature allows analytic tools such as Google Analytics to separate incoming traffic coming from organic and paid content. And lastly on the ads front, here’s your chance to try out our Facebook Custom Audiences Beta. This allows you to import Audience profiles to Facebook in order to re-target with your ads. Want to opt-in to this exclusive access? Reach out to our Support via email at: [email protected] Read more. Listen is now surfacing influencer data. The new Influencers Tab lists the top influencers involved with your search term or hashtag. Currently available for Twitter, it bases its ranking on the number of followers and, for news and blogs, domain rank score (i.e. how different pages link to each other). We are also bringing your social feeds to the big screen. Listen has just introduced a TV mode option, allowing you to present real-time content on big screens such as those in meeting rooms or display boards. You can view the display in landscape or portrait mode and choose whether the feeds appear in a horizontal or vertical format. The layout options may be restricted based on the number of feeds you have selected. Read more. The Help Center is now available in-app. No more switching in-between! Our latest features and releases will be readily on view in the in-app product changelog. It’s now super easy to see how a Tweet is performing. Just open a published Tweet and you’ll get an instant overview of impressions, retweets, replies and favorites. Our Publish Post Editor has also been refreshed. The Preview is now ‘sticky’ so no matter how far down you scroll it remains in view. The editor has also been split into two separate scrollable areas. Notes will now always be visible on 13-inch plus screens in the right-hand panel. Smaller screen users will still need to click a button to open the notes panel. The most used post options (labels & scheduling) are now closer to the top. Audience card interface and functionality are now even better. Button names now pop-up when you hover over them. CSV export is now also available directly from the card view. We’ve introduced some analytics and interface improvements to the Facebook channel report. With the “Most Engaged Users” function, you only need one click to filter out your most ‘engaged’ - those who have liked or interacted with you. If you prefer the old view, it is still available as the “Table” option.